Optoma launches HD82 1080p projector | What Hi-Fi? 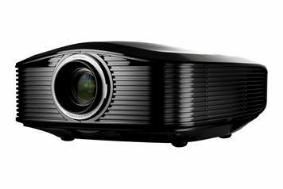 But Optoma still has more than half an eye on the other end of the market, the proof being the release of the HD82, 1920 x 1080, full HD resolution DLP projector. Optoma seems to have packed in plenty of proprietary technology, with Pure Engine at its heart, alongside Pure Optics, PureMotion and PureShift (we're noticing a theme here). There's a claimed 20,000:1 contrast ratio, plus 1300 lumens brightness, while noise level is measured at a respectably quiet 22db and the throw ratio is 1.50 - 2.28. The Optoma HD82 is on sale now for around £3000.